Stocks took a dip on Tuesday following some weak trade data from China. Just another day in December. The Dow fell more than 160 points, a nearly 1% dip. If was the sixth straight day where the Dow had a triple-digit point move. That's every day in December. So much for a Santa Claus rally? This is more like a Festivus sell-off. What's going on? Stocks surged in October and then were relatively calm in November. Many expected December to be solid. It usually is: Hence the Kris Kringle references. CNNMoney's Fear & Greed Index, which measures seven indicators of investor sentiment, has even fallen back into Fear territory. It was signaling signs of Greed just a week ago. Renewed worries about the health of the Chinese economy and the collapse in commodity prices are the main reasons behind the December dysfunction. Oil is now trading below $37 a barrel -- its lowest level since early 2009. Other commodity prices -- such as copper, platinum and zinc -- have plunged too. The pain in the commodities sector just led mining giant Anglo American (AAUKF) to announce plans to lay off 85,000 workers and sell a big chunk of its assets. Energy stocks have been among the biggest losers this month -- and they've dragged the whole market down a bit. Dow components Chevron (CVX) and Exxon Mobil (XOM) have tumbled 6% and 8% so far in December. And they're getting off easy compared to some other oil and mining stocks. Freeport-McMoRan (FCX) and coal miner Consol (CNX) are down about 15%. Southwestern Energy (SWN) and Williams Companies (WMB) have plunged 25% in the past week. And Kinder Morgan (KMI) has lost a third of its value since the start of the month. And if Chinese demand for goods weakens more dramatically than feared in the coming months, energy companies won't be the only losers. Apple (AAPL) generates a significant portion of its sales from China. So do several of its chip suppliers, such as Skyworks (SWKS), Qualcomm (QCOM), Avago (AVGO) and Qorvo (QRVO). Blue chips Starbucks (SBUX), Walmart (WMT), Tiffany (TIF), Kimberly-Clark (KMB), Western Union (WU) and MasterCard (MA) all have boosted their presence in China lately as well. Investors may also be showing some signs of unease ahead of a key Federal Reserve meeting -- even though it now seems all but certain that the Fed will finally raise interest rates next week. The Hamlet-esque to hike or not to hike debate has been a considerable source of market angst all year. But hopefully for not much longer. Still, investors always find a new obsession. Concerns about when the Fed will raise rates have been replaced by questions about, to use a Led Zeppelin-ism, how many more times the Fed will hike in 2016. "There has been a shift from "Will the Fed raise rates?' to 'When's the next one and how big will they be?'" said Jeffrey Kleintop, chief global investment strategist with Charles Schwab. Fed chief Janet Yellen may give some clues at her press conference next week. But Kleintop said investors won't be just focusing on the Fed. They'll be paying close attention to what the European Central Bank, Bank of Japan and People's Bank of China do over the next few months. 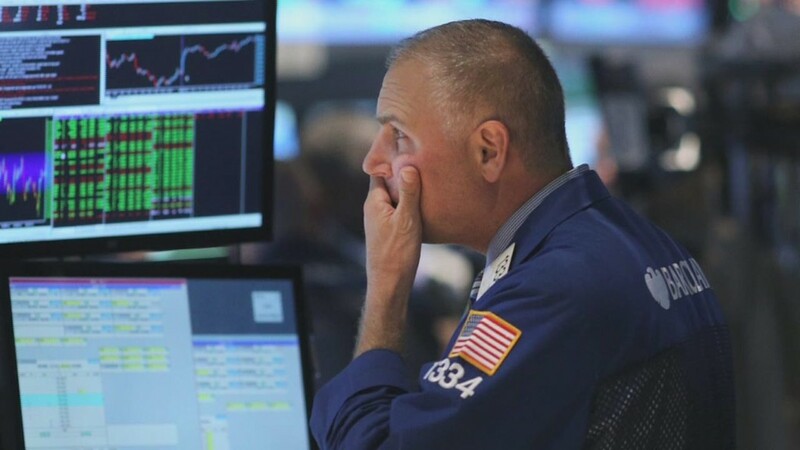 With all this in mind, Kleintop said stocks may wind up having a flat year in 2016. Sort of like how things are shaping up at the end of this year. The Dow is slightly lower heading into the final weeks of 2015 while the S&P 500 is largely unchanged. The Nasdaq is still up 7% though thanks to huge gains in Facebook (FB), Amazon (AMZN), Netflix (NFLX) and Alphabet (GOOGL) (aka Google) -- a fab four Wall Street traders have dubbed FANG. Those stocks are soaring thanks to strong earnings. But not many other companies are growing as rapidly as these four. "Earnings have been lackluster and valuations are above average," Kleintop said. "And there are still many geopolitical questions around the world. Volatility is here to stay. Expect a lot of up and downs in 2016."